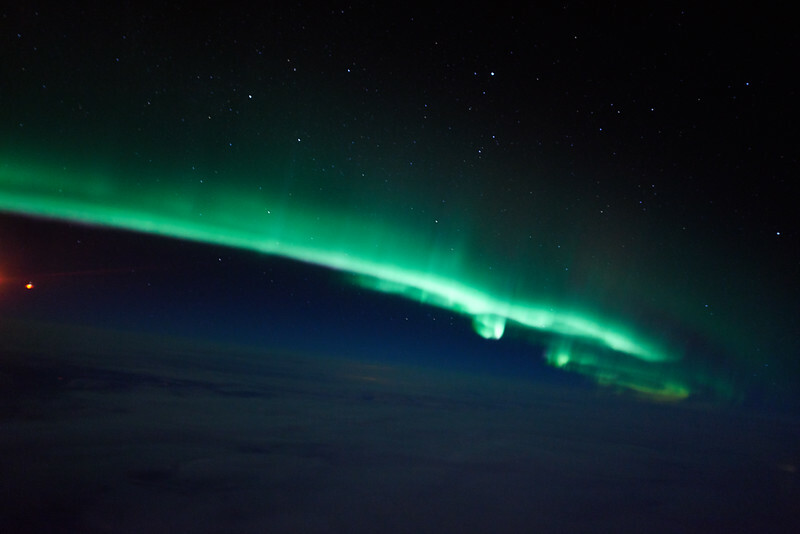 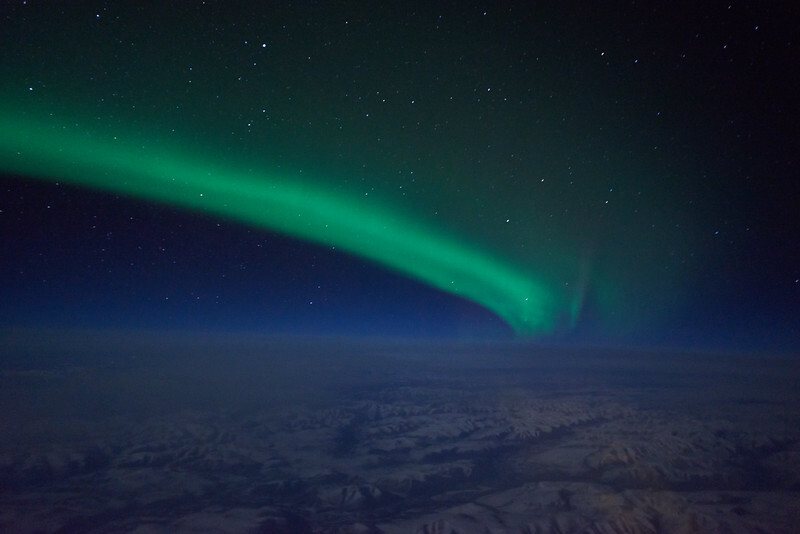 Photographed at a high altitude during the early morning "Red-Eye" flight from Fairbanks to Seattle, an active auroral display initially observed at 12:15 AM, soon became bright enough to allow for a few good captures with 0.5 - 2 second long exposures and steady hands through 01:30 AM. All photos in this gallery are available at a full-frame 36 Mpix (7360 x 4907 pixel) resolution, captured with a Nikon D800 camera & Nikkor 24mm f/1.4G ED lens at ISO 3200-5000 between 12:30-01:30 AM Alaskan Time (09:30-10:30 UTC) on March 27, 2013. 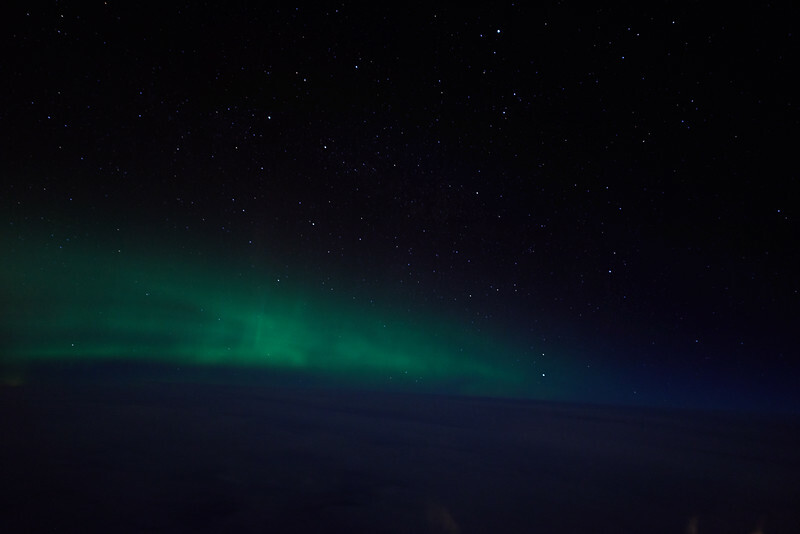 This full-frame 36 Mpix (7360 x 4907) image was captured at 12:32 AM on March 27, 2015 during an early morning flight from Fairbanks to Seattle - using a wide-angle 24mm f/1.4 lens. 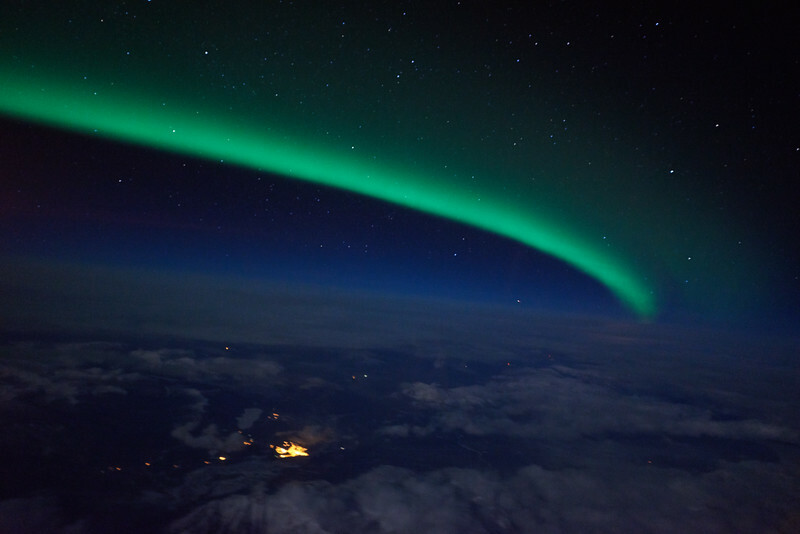 Full-frame (7360 x 4907 Mpix) image of an active auroral display captured during an early morning flight from Fairbanks to Seattle on March 27, 2015. 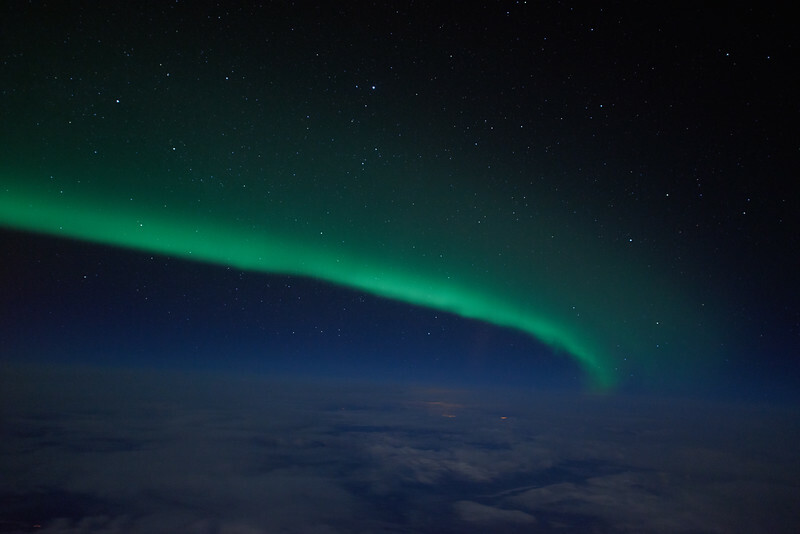 Another full-frame (7360 x 4907 Mpix) capture of a bright and active aurora occuring while on an early morning flight from Fairbanks to Seattle on March 27, 2015. A bright and active aurora appeared at 12:48 AM on March 27, 2015 during an early morning flight from Fairbanks to Seattle. A full-frame (7360 x 4907 Mpix) image of an active auroral display captured at 12:50:05 AM on March 27, 3015 during an early morning flight from Fairbanks to Seattle. A bright and active aurora appeared at 12:50:59 AM on March 27, 2015 during an early morning flight from Fairbanks to Seattle. 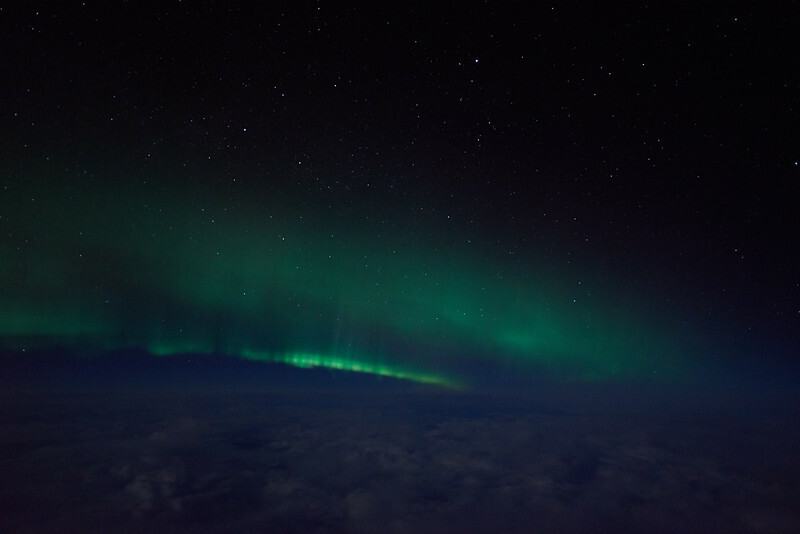 Full-frame (7360 x 4907 pixel) image captured at 12:51:29 AM on March 27, 2015 during an early morning flight from Fairbanks to Seattle. 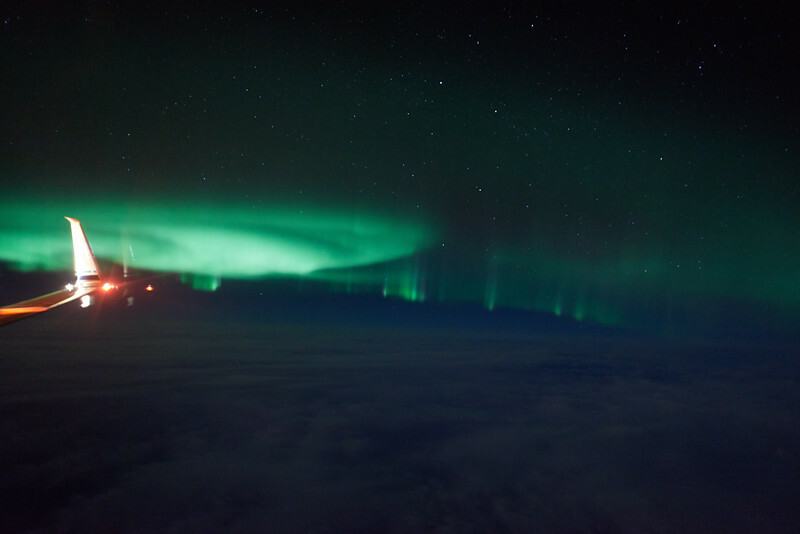 Full-frame (7360 x 4907 pixel) image captured at 12:51:31 AM on March 27, 2015 during an early morning flight from Fairbanks to Seattle. 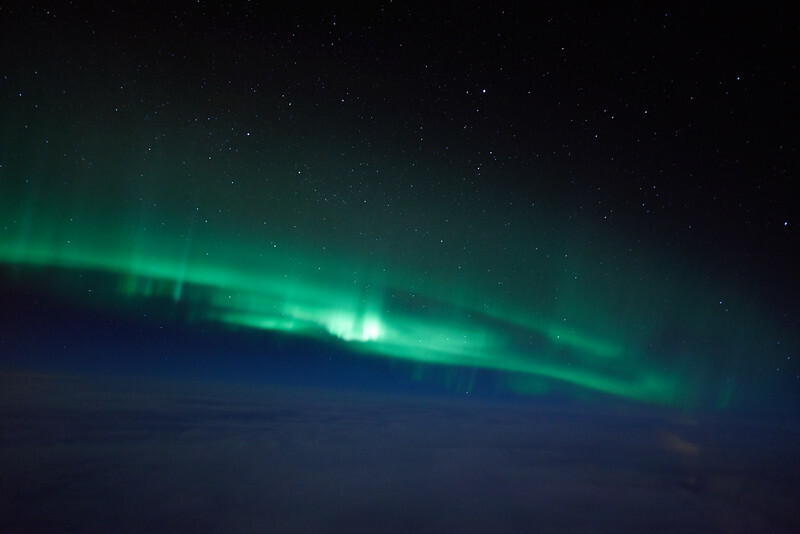 Full-frame (7360 x 4907 pixel) image captured at 12:51:39 AM on March 27, 2015 during an early morning flight from Fairbanks to Seattle. 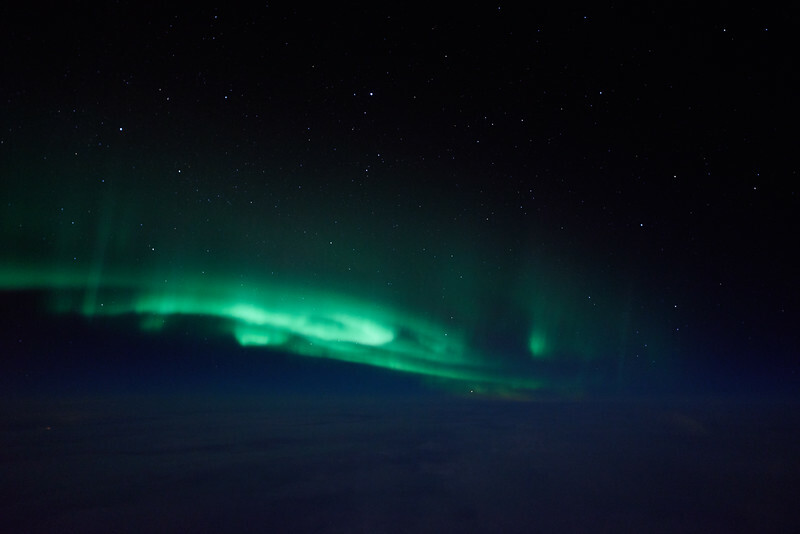 Full-frame 36 Mpix (7360 x 4907) image captured at 12:52:24 AM on March 27, 2015 during an early morning flight from Fairbanks to Seattle - using a wide-angle 24mm f/1.4 lens.